Here we have Hayley, age 7, and Brooke, age 4. They are a Penguin, and his pet, a Puffle... from Club Penguin, an on line interactive game by Disney. These costumes are Homemade by Mom, Margaret. Margarets daughters wanted to be these characters although they aren't known well enough to be for sale in Costume Stores yet. So... Margaret being the wonderful Mom that she is... put her mind to it and created some very cute Costumes that her daughters were thrilled to wear! Thank you Margaret... and Thank you Hayley and Brooke. HOW DO U MAKE IT?! HELP! 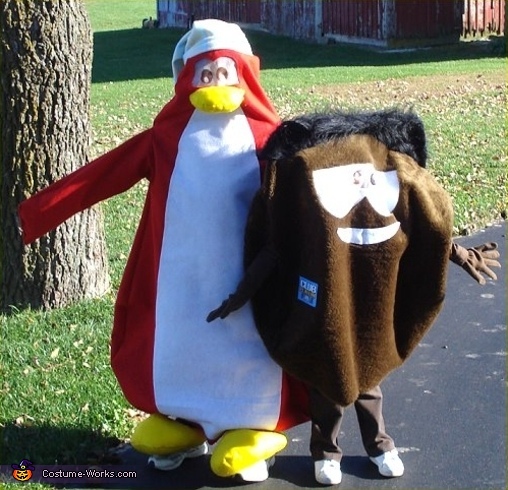 My son wants to be a club penguin for Halloween.. How did you make this costume? it's adorable! Is it possible to purchase? would you consider selling these costumes or remaking them to sell? Would you be able to make two penguins in two different adults for teenage girls?